Is this water heater properly braced? 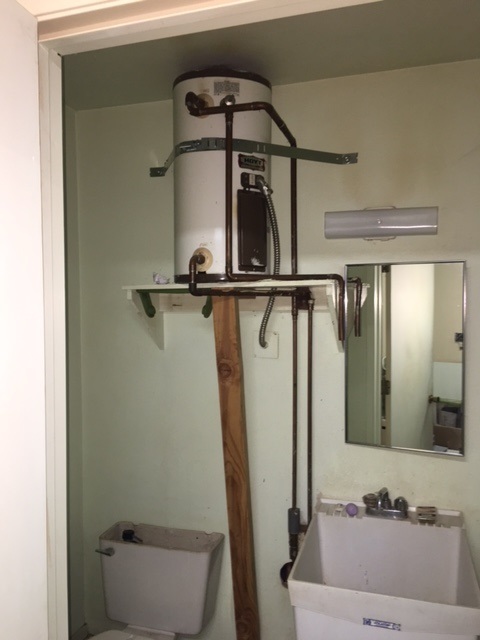 Water heaters in California must be anchored or strapped to limit lateral movement in the event of seismic activity. In most cases, this is done by installing bracing/strapping systems commonly available for purchase that are approved by the California Division of the State Architect. Other methods of securing the tank are normally permitted so long as they properly and securely brace the tank to prevent movement. Check with the local building department in your area to find what is required for your area. The tank in the photo above is “strapped” but in no way secured to prevent lateral movement in the event of an earthquake. The tank may not directly move from side to side however that small shelf the tank sits on is braced with only a 2×4 to support the weight. It would not take much movement to have the entire unit fall, breaking the connections and even causing harm to people. Imagine sitting there at the moment of “the big one”.